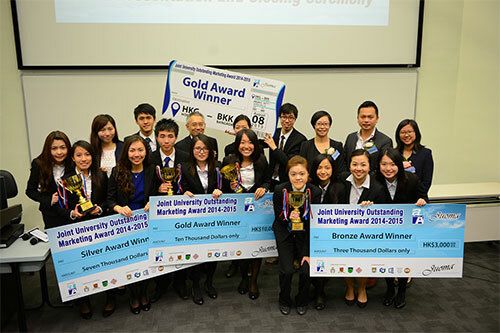 Hong Kong, 28 April 2015 – The Joint University Outstanding Marketing Award (JUOMA) 2014-15, with the theme ‘Innovation through paper’, has named the winners of this year’s competition. The students from City University of Hong Kong bagged the Gold Award for their brilliant concept of branding Double A paper into ‘FUN, SMART and GREEN”, as well as the Best Advertising Video Award. This year’s champions received HKD 10,000, a trophy and an all expense paid trip to Thailand to visit Double A paper’s mill and farmed trees (Paper from KHAN-NA). Silver Award went to the team composed of students from the Hong Kong University of Science and Technology, City University of Hong Kong, The University of Hong Kong, Hong Kong Baptist University and Chinese University of Hong Kong, while the Bronze Award went to the Hong Kong Polytechnic University. Mr. Thirawit Leetavorn, Double A’s Senior Executive Vice President and member of the judging panel, complimented these five finalist teams on their courage and creativity to present their proposals, including the marketing positioning, product promotion and a series of events. “All teams performed well. They brought a combination of strategic thinking and creativity to raise Double A’s awareness and loyalty. I hope the students take the lessons learned from this competition and continue applying the key principles in their studies and their careers”, he added. The champion team from City University of Hong Kong believed that “people-oriented” approach is the key element of a marketing plan. Their proposal executed through three levels, including customer experience, social network (the relationship between end-users and Double A) and corporate. Their idea originated from the strong office image of Double A. “Nowadays, working in Hong Kong is very stressful, thus the sense of humour brought about by the advertisements of Double A became the theme of our proposal”, a member stated during their presentation. They wished Double A to become the best partner in the office, and whenever people talk about Double A, “No Jam Paper” is the first that comes to mind. The team recalled the hard work they invested on their proposal and showed their deepest gratitude to those who supported and gave valuable advice to them. “In the finals, when one of the judges asked who the leader is, we replied that we share the leadership. Each member has something to offer. We made it this far, thanks to the unique strength of each member. We are very excited to embark on another journey, this time to see the ‘secret’ behind this paper manufacturing kingdom in Thailand and experience the real farm life”, shared Ms. Marilyn Au from the winning team.